There was a time when mobile printing seemed downright futuristic. But, now that smartphones are a critical piece of office equipment, printing a document from your phone is a real possibility. And, in reality, it should be standard practice in today’s modern business climate. If your company has not yet embraced mobile print technology, here’s your opportunity to learn how it can boost your business. Mobile print is just what it sounds like — the ability to send a print job from your mobile device, which could be a smartphone, tablet, or laptop. There are two options for retrieval on the print end. Some documents will automatically print right away, while others must be released by the printer or MFP. What are the Benefits of Mobile Print? Pretty much every business is looking to enhance productivity and having the best office equipment is one way to make that happen. Mobile print lets your employees print from any location, such as an off-site meeting, while commuting, or on a business trip. Today’s workforce is agile, so don’t let outdated technology hold your biz back. 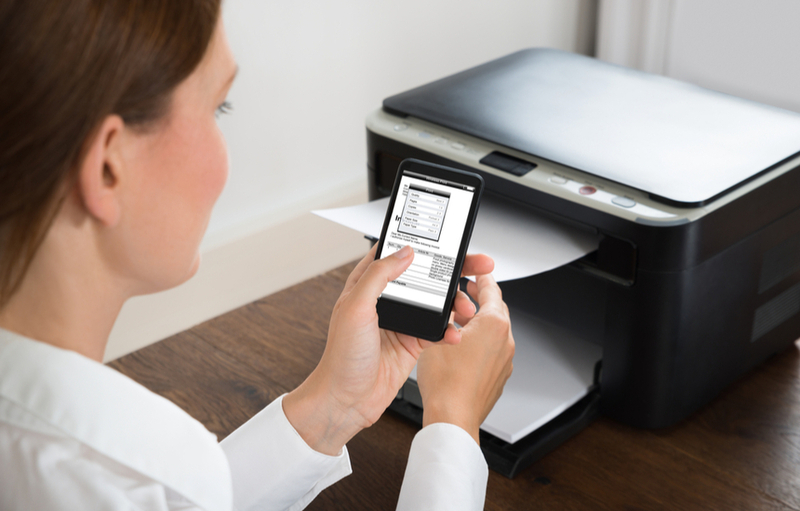 Depending on your current office equipment, you can implement mobile print for little to no cost. Plus, enabling employees to print from anywhere reduces the need to multiple printers across various locations. Save money by upgrading your print infrastructure and replacing unnecessary office equipment with cutting-edge network solutions. Knowing you can print at a moment’s notice offers peace of mind, especially for traveling staff, such as salespeople. No more worrying about printing documents just in case you might need them. You can leave the office knowing that you can always print whatever documents you might need, right when you require them. Beyond the specific mobile print benefits listed here, convenience might be the most important. With technology continually evolving, it is imperative that your business keeps pace with the changes and not get left behind. Mobile print is a necessity in today’s tech-driven society. Learn more today.